9 carat Gold Bracelets set with Real Diamonds. A wide selection of White and Yellow 9ct Gold genuine Diamond Stones set Bracelets for Men and Women at low wholesale prices. From 1ct Brilliant Cut Diamond set Ladies elegant Bracelets to large 9ct Gold Mens Diamond details Curb Bracelets. Large Gents Diamond set detail Square Curb 9 carat Yellow Gold Bracelet. Length approx 210mm. 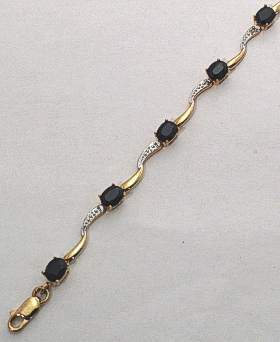 9 carat yellow Gold Sapphire and Diamonds set ladies Bracelet. 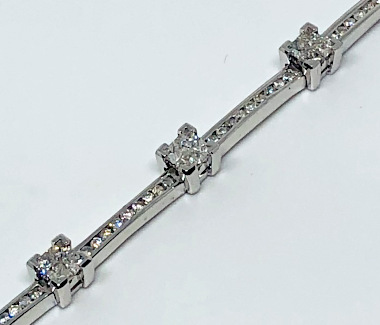 9 carat White Gold Bar style bracelet set with genuine Diamonds. 9ct Gold Tennis Bracelet set with 2 Carats of Diamonds. Popular Tennis style Bracelet with two rows of Diamonds set in yellow 9 carat Gold. 9ct White Gold wide Diamond set Loops Bracelet, 190mm length x 6.5mm wide. 9ct White Gold Circles design Bracelet set with 3 real Diamonds in every alternate bracelet link. Wide Diamond Circles Ladies elegant Bracelet. 9ct White Gold Stunning 1 Carat Diamond set Ladies Bracelet. Elegant White Gold Bracelet set with 1Ct Excellent Quality Diamonds. 9 carat Yellow Gold Wavy design Diamonds set Bracelet. 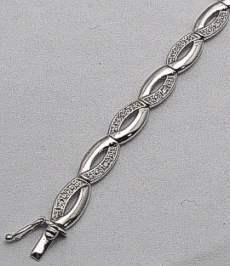 9ct White Gold Diamonds set Wavy Twist links design Ladies Bracelet. 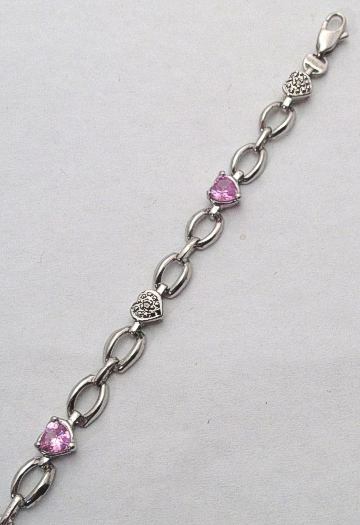 9ct White Gold Heart design Bracelet set with Pink Heart shape stones and Diamonds. 9 carat White Gold 0.15Ct Diamonds Bracelet. 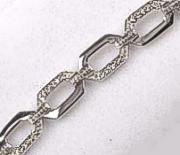 Woven design 5mm wide ladies bracelet in polished 9ct White Gold set with 20 Diamonds for total 15 points Diamonds. 180mm (approx 7inch) length Weave shape bracelet with tongue and safety clip clasp. 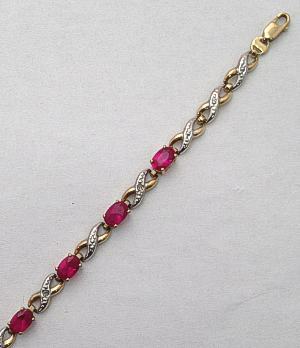 9 carat Gold Diamond Kiss Bracelet set with created Ruby Red colour Stones 185mm. 9 carat White Gold Topaz and Diamonds set Bangle. approx. fitting internal dimensions 55mm x 50mm. 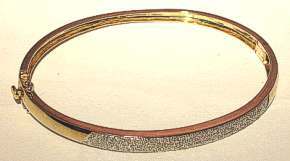 Wide 9 carat Gold 25pts Diamonds encrusted Bangle. 9 carat yellow Gold Diamond Wave Bangle set with 0.10 Carats of Diamonds (10 points). Safety catch and tongue clip fastening. Approximately 60mm x 55mm bangle diameter. 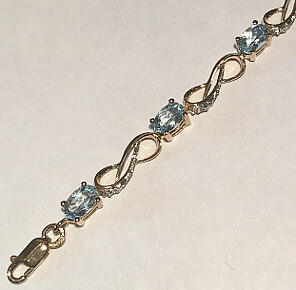 9 carat yellow Gold Fancy bracelet set with Blue Topaz oval stones and Diamonds.